What do you get when you put William Burns, Clarence Darrow and D.W.Griffith together in one book that links them all? One of the greatest true detective stories ever written. 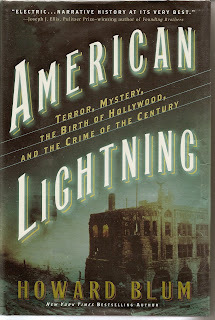 The sheer scope of this book- from the explosion by anarchists at the LA Times in October 1910 to the Union battles of Chicago and the discovery of a nation wide plot by the Unions to destroy Capitalism, to the nascent film studios of D.W. Griffith in NY City and then back to Los Angeles for a sensational trial this book never stops giving the reader one surprise after another. Add to this the battle for water rights in LA and the surrounding county (the underlying true story behind the Jack Nicholson movie “Chinatown”) and throw in some Mary Pickford and you have a book that can’t be put down. Mr. Blum doesn’t confine himself to just the story- as if that wouldn’t be enough- he delves into the lives of the participants in detail- showing the how and why of the actions undertaken by each in this intricately told tale of domestic terrorism long before 9/11. motivations that led one of the greatest legal minds of his day to commit bribery and suborn perjury in his quest to seek justice. This book reads like a Robert Ludlum spy thriller- just when you think you’ve got it- you get another surprise.